March 17, 2011, 7:12 p.m.
By Joshua Benton @jbenton March 17, 2011, 7:12 p.m.
As Ken Doctor wrote earlier today, a big part of the success or failure of the new New York Times paywall will be based on how it treats those who bump up against it. Will it be a public-radio pledge-drive soft sell, gently noting how nice it would feel to support quality journalism? Will readers on their 21st article of the month be confronted by an image of Sulzberger & Keller looking dejected over the tightfistedness of the clicker in question? What kind of pitch would work best when someone is at the moment of pay-or-no-pay truth? We in the United States aren’t scheduled to see the Times’ approach to that moment until March 28. But with a little technical finagling, I can report that the box above is how the Times is choosing to deal with that fateful moment. From my office in Cambridge, I created a new dummy nytimes.com account (pierretrudeaujustwatchme@gmail.com, an homage) and logged onto a Canadian proxy — a server that allows you to appear to a website to be coming from somewhere you aren’t. In this case, Toronto. One more click to one more story and up came the image you see above. We hope you’ve enjoyed your 20 free articles this month. As you may already know, we are now charging for unlimited access to our content. You can come back next month for another 20 free articles or choose unlimited access with a Digital Subscription and continue to enjoy the world’s best journalism, anytime, anywhere and on any device. Subscribing is quick and easy. I’ll leave it up to the marketing experts and the consumer psychologists to say whether or not that’s an effective pitch, but it seems pretty good to me: no giant animated wagging finger, no background audio murmuring “Pay, freeloader, pay!” In any event, I assume part of the next 11 days will be spent testing out a variety of pitches; after all, this sort of call-to-action is pretty much what A/B testing is designed for. It’s a neat mix of code: links within the article and sidebar are no longer clickable behind the overlay, but the top nav bars (the Home Page/Today’s Paper top one and the World/U.S./N.Y./Region one) both remain clickable — a subtle suggestion to keep exploring even if this particular alley’s proved a dead end. 99 cents a week for the first four weeks, then $3.75 a week after, which matches the $15/four weeks advertised price. (That’s all in American greenbacks, not loonies.) The payment form only has space for credit card info, but the fine print at the bottom references PayPal — perhaps that’ll arrive with the American paywall. In all, it looks like a perfectly functioning paywall, with lots of holes — social media, search, the View Source command in your browser — predrilled. Now, we wait to see whether in holding back some readers, it lets in some revenue. POSTED March 17, 2011, 7:12 p.m.
Benton, Joshua. "Here’s what the New York Times paywall looks like (to Canadians)." Nieman Journalism Lab. Nieman Foundation for Journalism at Harvard, 17 Mar. 2011. Web. 25 Apr. 2019. Benton, Joshua. 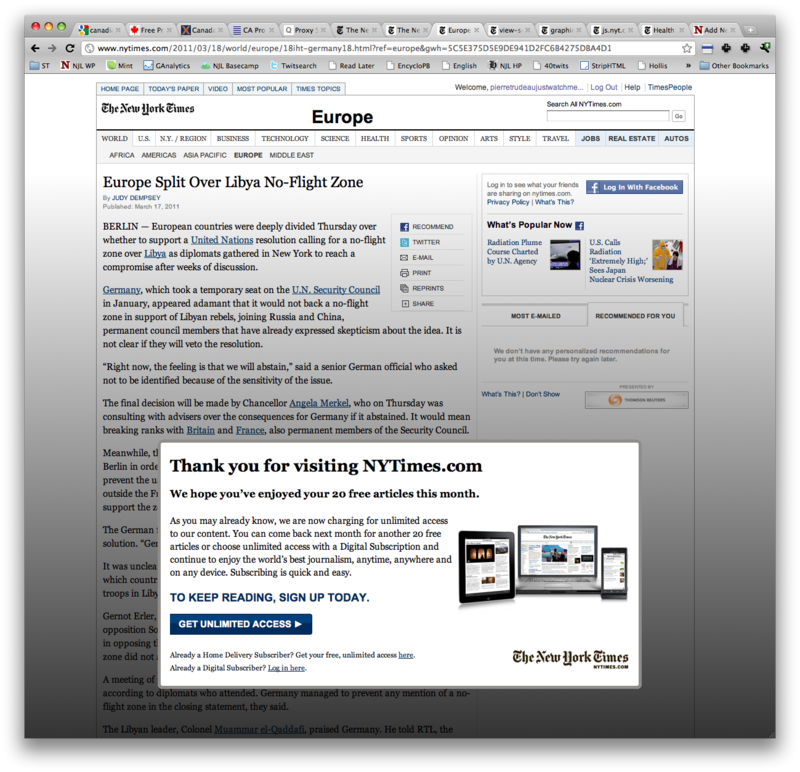 "Here’s what the New York Times paywall looks like (to Canadians)." Nieman Journalism Lab. Last modified March 17, 2011. Accessed April 25, 2019. https://www.niemanlab.org/2011/03/heres-what-the-new-york-times-paywall-looks-like-to-canadians/.